An infection once feared by pregnant women has been all but wiped out in Australia thanks to a vaccine that has been a fixture of childhood vaccinations for almost three decades. 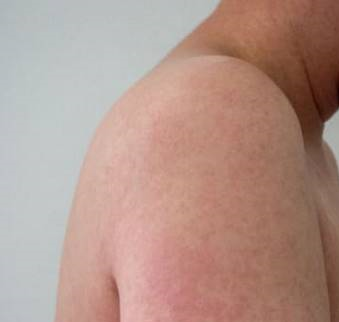 The World Health Organisation recently declared that rubella, also known as German measles, had been eliminated in Australia, according to its official threshold. The trickle of cases today is a far cry from the epidemics of the late 1950s and early 1990s, which saw thousands of people infected, and resulted in stillbirths and birth defects that had life-long impacts. Rubella often causes a rash and mild symptoms such as nausea, a low fever and conjunctivitis. For some, the illness is so innocuous people do not realise they have it, but the infection remains extremely dangerous for pregnant women, especially in the first trimester. In about 85 per cent of cases it causes miscarriage, stillbirth or other serious side-effects to the developing foetus that results in the baby being born deaf, developmentally delayed or struggling with heart defects. Professor Elizabeth Elliott from the University of Sydney said when she first started working in paediatrics almost four decades ago she would see children born deaf and with eye and heart problems as a result of rubella exposure during early pregnancy. The rubella vaccine was first rolled out in Australia in 1971 for schoolgirls. It was added to the childhood vaccination program in 1989 and is now given with an injection combined with measles and mumps at one year and then 18 months.